Since moving to Carmel in April, I have been enjoying the very different coastline than I have been used to in Southern California. Although there are rugged sections in Laguna and Malibu which provide dramatic scenery, it is very different in this central and northern part of the state. The colors of the sea and the vegetation are all so varied. The color of the ice-plant is very distinctive for this area as well. In addition to the normal olive green, it can turn orange and deep red. The ocean here is clear and can have very tropic colors. I love exploring it all. “Garrapata Trail – California State Park” 15×20″ Oil on Canvas. 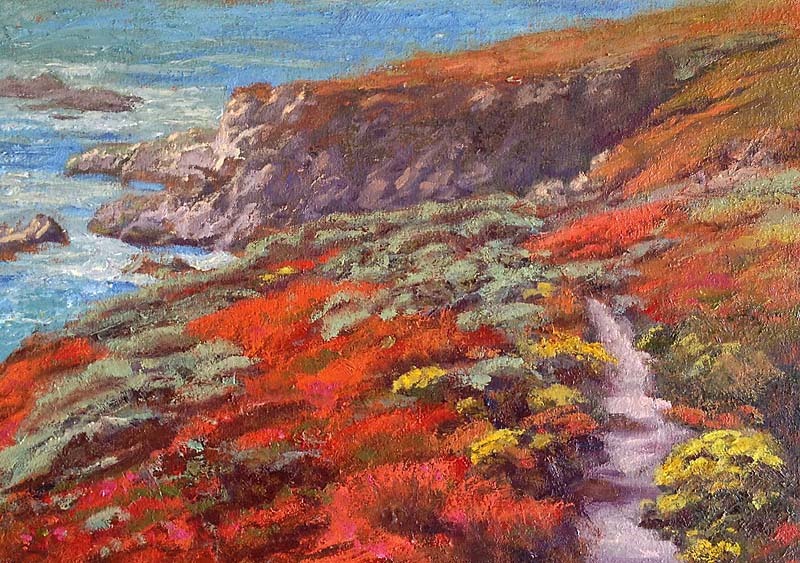 I entered this painting of mine called “Garrapata Trail – California State Park” in Pacific Grove Museum‘s “Central Coast Landscapes: Celebrating Nature in Painting.” The curator wanted to get a chance to meet some local artists because they want to begin adding original paintings to their display cases of local animals that have been preserved through taxidermy (stuffed animals.) So with over 200 entries by Central Coast artists, I was one of the 40 chosen to be in the the exhibition. I won the award for Best Depiction of a California State Park by the California State Park Foundation. For that was awarded an annual State Park Pass — good for entry to ALL of the State parks! YAY! I am so happy. Perhaps I will even go explore beyond Pt Lobos once in a while. Perhaps I will also get a chance to submit a proposal for some doing commissioned work for the museum. If you are in the area and want to see the exhibit, the show will be up until April 5th, 2014.